Combining human and machine intelligence. Sixth and final game in the rematch between world chess champion Garry Kasparov and IBM supercomputer Deep Blue. Deep Blue famously wins the game, the first time where a computer outplays a chess grandmaster. 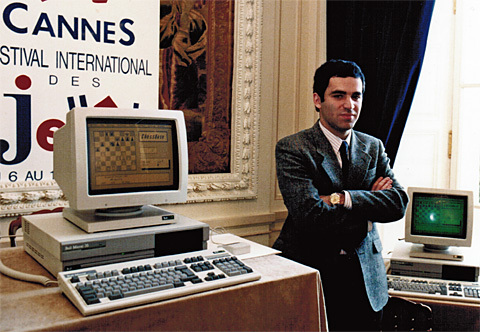 The world's first championship of advanced chess organized by Kasparov. In advanced (alt: freestyle or centaur) chess, humans of any expert level play assisted by technology such as hardware, software and databases. Over the following year, a community of advanced chess players develops, designing various approaches of combining intelligence for chess playing mastery. Having evolved their methods, centaur players regularly start out-playing both chess grandmasters and supercomputers in 2005. Teams today win by combining average skill players, mid-range technology and strong interfaces. By optimizing for an efficient connection between human and machine, teams can better leverage the characteristics of either. When the smartest guy in the world speaks, you probably want to listen. being able to critically judge and analyze a chess game, plan, opening or endgame. giving the viewing audience a remarkable insight into the thought processes of strong human chess players and strong computers, and the combination thereof. Big data on user behavior and quantified content metrics. There are two kinds of jobs now - jobs that you can do better with an AI assistant, and jobs that an AI assistant can do better than you. IA, or Intelligence Augmentation, is all about empowering humans with tools that make them more capable and more intelligent, while traditional AI has been about removing humans fully from the loop. Computer scientists say that often the best use of artificial intelligence is not to pit it against humans, but to pair it with them. To that end, two Go professionals, each teamed with AlphaGo, are scheduled to play against each other on Friday. Mr. Hassabis has said that top amateur Go players, with the help of AlphaGo, can generally manage to beat the software program in a match. In short, a human with a computer is still stronger than a computer. "Those weavers who smashed machine looms in Ned Ludd’s rebellion of 1811 didn’t realize that descendants of those machines would make unbelievable things possible. We’d tunnel through mountains and under the sea, we’d fly through the air, crossing continents in hours, we’d build cities in the desert with buildings a half mile high, we’d more than double average human lifespan, we’d put spacecraft in orbit around Jupiter, we’d smash the atom itself! What is impossible today, but will become possible with the technology we are now afraid of? "In contrast to AI, which is a standalone system capable of processing information as well as or better than a human, IA is actually designed to complement and amplify human intelligence. IA has one big edge over AI: it builds on human intelligence that has evolved over millions of years, while AI attempts to build intelligence from scratch. "The best players in the world are not machines however, but what Garry Kasparov, a grandmaster, calls “centaurs”: amalgamated teams of humans and algorithms. Such collectives will become the norm in all sorts of pursuits: supported by AI, doctors will have a vastly augmented ability to spot cancers in medical images; speech-recognition algorithms running on smartphones will bring the internet to many millions of illiterate people in developing countries; digital assistants will suggest promising hypotheses for academic research; image-classification algorithms will allow wearable computers to layer useful information onto people’s views of the real world. Yes centaur — and Kasparov was apparently the first. Rather than half-horse, half-human, a centaur chess player is one who plays the game by marrying human intuition, creativity and empathy with a computer’s brute-force ability to remember and calculate a staggering number of chess moves, countermoves and outcomes. 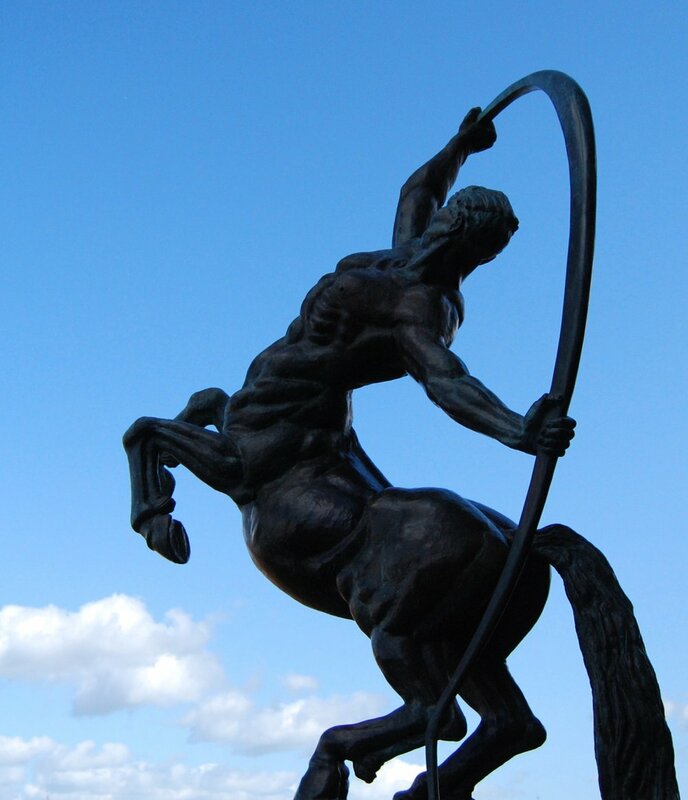 The centaur story is an elegant example of the way visionaries see the optimal interplay between humans and machines. Teaming the two in chess, experts say, produces a force that plays better chess than either humans or computers can manage on their own. The third step involves the genuine augmentation of pre-frontal cortex. This is the Holy Grail of IA research — enhancing the way we combine perceptual data to form concepts. The end result would be cognitive super-McGyvers, people who perform apparently impossible intellectual feats. For instance, mind controlling other people, beating the stock market, or designing inventions that change the world almost overnight. In what Rasskin-Gutman explains as Moravec’s Paradox, in chess, as in so many things, what computers are good at is where humans are weak, and vice versa. This gave me an idea for an experiment. What if instead of human versus machine we played as partners? My brainchild saw the light of day in a match in 1998 in León, Spain, and we called it “Advanced Chess.” Each player had a PC at hand running the chess software of his choice during the game. The idea was to create the highest level of chess ever played, a synthesis of the best of man and machine. Some argue that freestyle chess players had a window of success against machine players, and that AI has generally caught up with human chess players.